Win a $10 gift card. Win a free month of Unlimited Classes. We are so excited for SUMMER to finally be here, after a winter that dragged on and a spring that was all rain.. we are ready for some sunshine! This summer, we’re inviting you to take part in our Passport challenge. The goal is to get each box on your passport signed by an instructor. Every time you fill a passport, we’ll apply a $10 credit to your account (can be used on retail, classes, massage, reiki, whatever!). At the end of the summer (wah!) 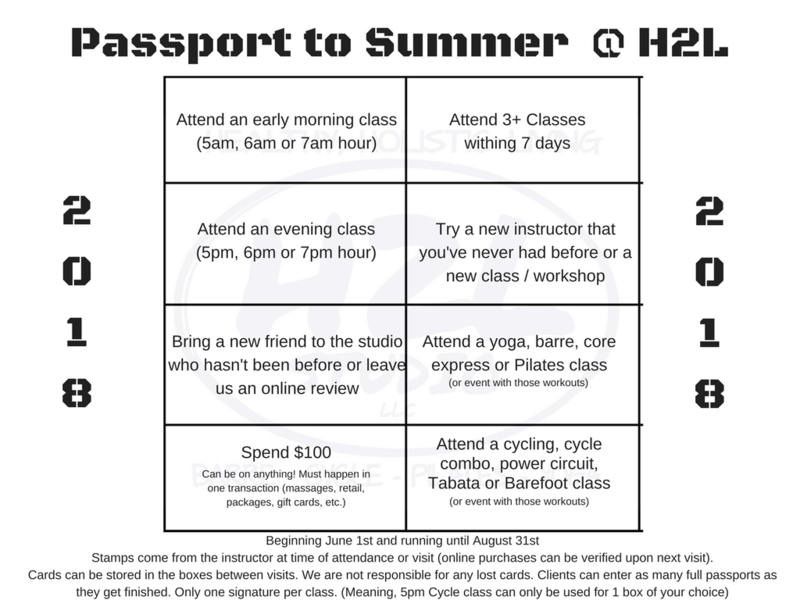 we’ll draw 3 winners who will each win 1 month free of UNLIMITED CLASSES. Here’s a peek at the passports, so you can start planning your attack ;). Pick your own up in the Pilates room at the studio, make sure you put your name on it and store it in the bin so you don’t lose it! So.. here are some questions you may already have and our answers. We hoping this is a good motivator to keep you in your routine or find a new one! Maybe, you’ll try something new and FALL IN LOVE. Who knows, crazy things happen in the heat of the summer! How many signatures can I get each class? One. BUT you can choose which box we sign. For example… if you are attending an evening class and it’s a new instructor you have the option of two different boxes. We recommend choosing the one that is least likely for you to happen again. So, if you typically are a morning workout person, have the instructor sign the evening box. How many signatures can I get a day? As many classes as you attend that fit the descriptions! Who signs the cards? The instructor of the class you are attending. If you accidentally missed a prior signature (maybe you had to run out to get to work, or maybe you just forgot) we can go back and take a look at past classes WITHIN A WEEK. If it’s The end of August, and you want someone to sign off on a class you attended in early June.. we can really verify that so far along.. so try to keep on top of it! I spent $100, but I did it online, who signs? No problem! Next time you are in the studio following your online purchase, let your instructor know and they will sign off on that box and date it! Do events count? Yes! Looking ahead at our summer calendar keep in mind the following events would work for the following boxes. There’s more than this, we’re just giving you an idea! 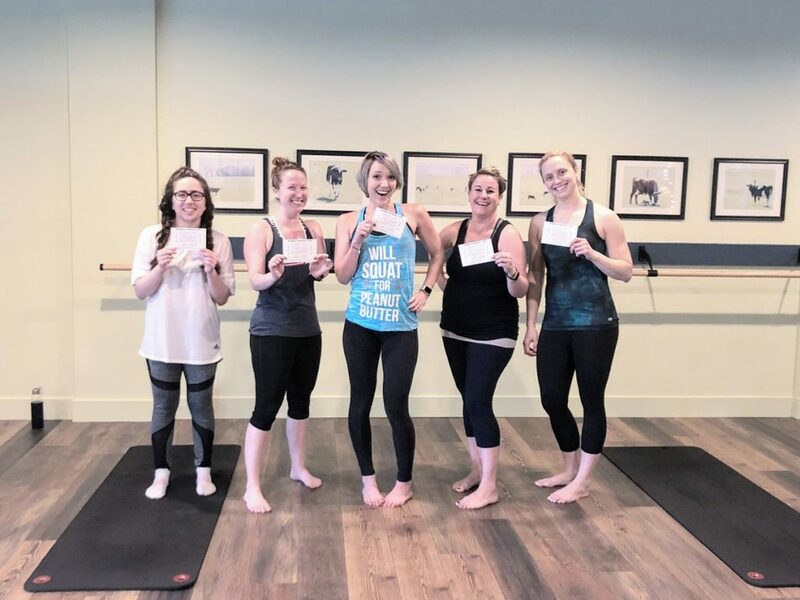 Attend a yoga, barre, core express or Pilates class – Yoga & Beer Pop-Up Class at Appalachian Brewing Company, Recovery Ride + Restorative Yoga (would count towards this box, OR a cycling class! ), Any of the Yin Yoga classes this summer with Deborah (Yin for Better Sleep or Yin for Hips & Low Back)… and more! Attend an evening class – ANY of the evening workshops this summer would count for this (anything 5pm or later). Do weekend classes count? Of course! They can be used for any box that applies… including the early morning class box if you attend a 7am class on Saturday or Sunday! Who signs when I attend 3+ classes in 7 days? Your 3rd class instructor (or 4th, 5th, 6th, depends on how you want the box to be applied) They will sign and date it. Bring a new friend to the studio or leave us an online review box – this can be signed by the instructor the next time you are in the studio, if it’s a review online, show them it and they will sign and date. If it’s a new friend, hopefully, they are there with you.. or if they went to another class, we’ll check and sign off with our name and date! What if I lose my card? We have a box set up in the studio for you to store your card so you don’t lose it. Please make sure you add your name to your card when you first get it. 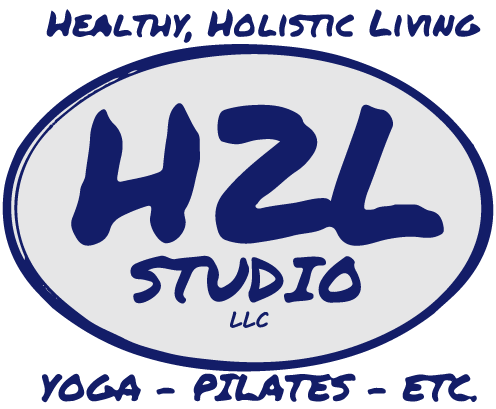 If you lose it.. please email info@h2lstudio.com and we can work on getting you a replacement card with the signatures as much as we can! If you think of any other questions or aren’t sure how things will work, please don’t hesitate to reach out!